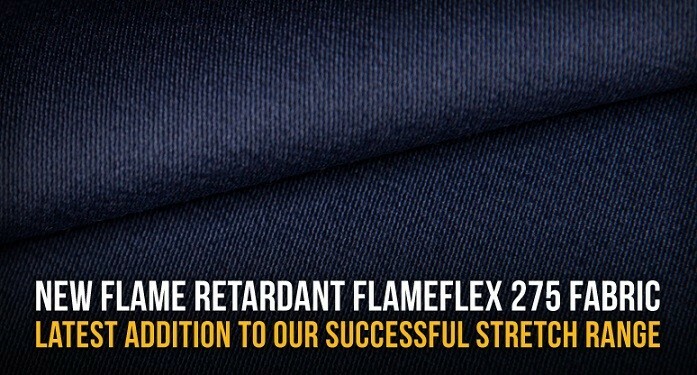 “We are excited to announce the launch of a new flame-retardant product to complement our hugely successful stretch range that was launched in 2017”. Flameflex 275 is Carrington’s first industrially launderable stretch flame retardant product, combining the need to be full certified to the rigours of FR performance along with the comfort and durability of a stretch product we believe Flameflex 275 will be the first of many FR stretch fabrics Carrington will bring to the market. At 275gsm its perfectly suited to be a mid-weight comfortable FR fabric meeting EN 11611,11612 and 14116. Initially offered in 5 stock supported colours Flameflex 275 is the perfect solution to the textile market where functionality alongside safety is key. Ideal for everyday workers who require garments that provide ease of movement but that also benefit from an increased level of protection, the Flameflex 275 offers a revolutionary solution in the marrying of two of our ranges; flame retardant and stretch. The use of elastolefin fibres within the material allows for the inclusion of polyester, which increases the strength and abrasion resistance of a previously cotton-based fabric. A durable fabric which withstands industrial laundering of up to 75 degrees and meets accreditations EN11611, 11612 and 14116, the Flameflex 275 encompasses everything we set out to achieve following three years of research and development. The Flameflex 275 is comfortable, mid-weight, and adaptable to worker’s movements, meeting the demands for a protective workwear which moves away from rigid, blocky silhouettes. The Flameflex 275 will officially launch at France’s leading biennial trade show for risk prevention and management; Expoprotection, taking place between 6th – 8th November 2018.